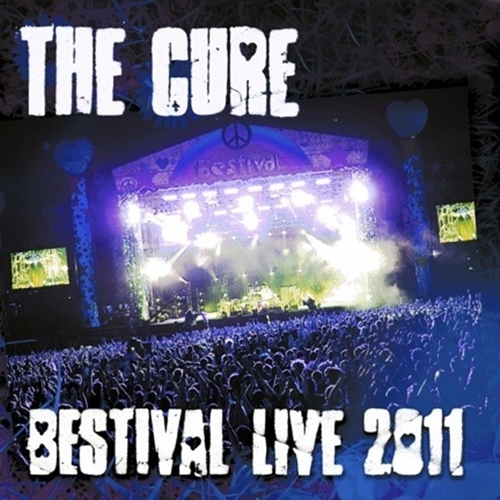 The Cure will release a 2CD live recording next month of its full, 32-song set at the U.K.’s Bestival this past September, marking the first official live album from Robert Smith and Co. since 1993’s back-to-back Show and Paris releases recorded during the Wish tour — and the first time the band ever has released a complete concert on disc. Although the band hasn’t formally announced the release, fansite Chain of Flowers points to an Amazon.com listing showing the double-disc Bestival Live 2011 release is scheduled for Dec. 6, and further confirms that the live album, to be released via Fontana and PIAS America, will feature the complete concert, including the 12-song encore sets (see full tracklist below). UPDATE: The band has officially announced the release, which will benefit the Isle of Wight Youth Trust. Cover art is posted above, and the official tracklist is below. To date, The Cure has released four live albums — in addition to Show and Paris, there’s 1984’s Concert: The Cure Live and 1990’s Disintegration addendum Entreat — but none of those releases has captured one single performance in its entirety. The Bestival appearance (see video here) featured keyboardist Roger O’Donnell back in the lineup, and included only the second performance of “The Caterpillar” since the band’s 1984 tour (it last had been played during a 1991 taping of “MTV Unplugged”). Smith also has said he plans to release a DVD of the “Reflections” concerts at the Sydney Opera House earlier this year, but that, “I suspect Live in Paris 2008 may beat it out,” apparently a reference to a film of The Cure’s March 12, 2008, concert at the Palais Omnisport de Paris-Bercy. Craig is still bitter ’cause he couldn’t get tickets to Justin Beiber. Craig, then why are you commenting on a The Cure news item? Wow! That is a fantastic set list! Can’t wait to hear this one! Except Trilogy, released in 2002, features three complete albums performed in their entirety. “Festival” is a live release from 2005. I’m not 100% sure but I think “Trilogy” did. Yes, but those are DVDs, not live albums. The Cure has released films of complete shows (although Festival is not one of them), but this is the first live album of a whole concert. I see, thanks, I didn’t catch the distinction.